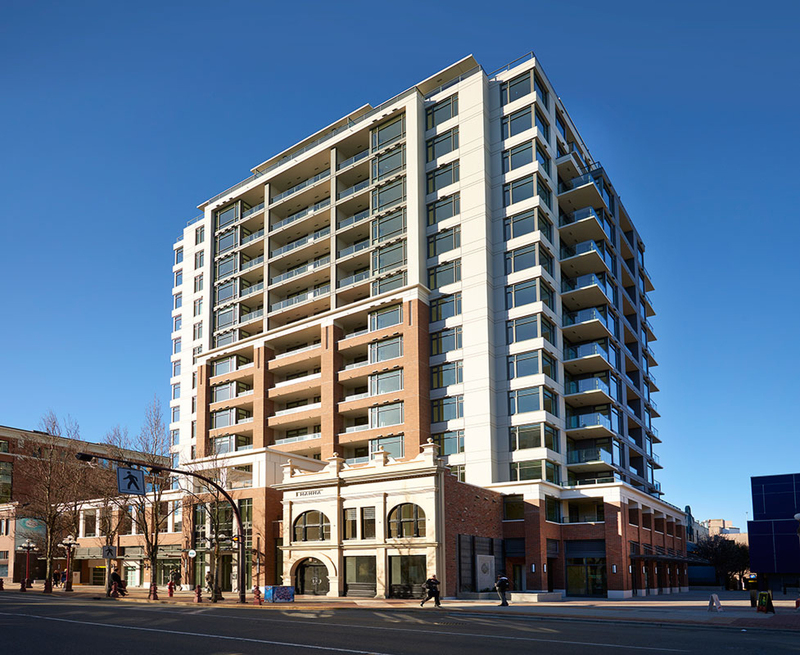 Since 1989, BC’s Concert Real Estate Corporation has developed and managed a diverse portfolio of award-winning properties including Victoria’s own Astoria, Belvedere, Chelsea and 365 Waterfront. With near 150 building and customer service awards on their mantle, Concert’s brand has become synonymous with condo real estate excellence in Victoria, BC. The reputation is well-expected to live on at Concert’s newest condo development – Era on Yates Street. About the site for this well appointed highrise residence, convenience is certainly not spared; imagine a neighborhood which provides every amenity and luxury at your doorstep – dentists and hot yoga, proximity to transit, boutique shopping and gourmet dinning, local organic cafes and countless outdoor activities. Era and its residents will grow in the heart of Victoria, BC and enjoy the very best our city has to offer. Era will fuse the warm, historic architecture of old Victoria with modern concrete and glass – a combination for true West Coast sophistication. Built to an admirable LEED Silver standard for environmental sustainability, Era will be as eco-friendly as it will be stylish for Victoria, BC condo buyers; 75% of construction waste will be diverted from landfills and energy-efficient appliances and programmable thermostats will reduce each resident’s carbon footprint and reward them with economical utility bills. Era will even provide a car share vehicle and bicycle parking to reduce greenhouse gas emissions and reliance on personal vehicles. Clean floor plans set the scene for stylish urban living at Era. Condo buyers will relish the tactile luxury of polished chrome accents, solid-core entry doors, cool quartz countertops and textured laminate cabinetry. Of considerable worth, Era residents will rest peacefully knowing their purchase is backed by Concert’s own exclusive “Commitment to You” warranty: 10-year structural coverage, 6-year water penetration coverage, 2-year coverage on workmanship and materials – all backed and matched by BC’s Travelers Guarantee. For first-time condo buyers and investors alike, Era is an ideal solution for sensitive, convenient urban living in Victoria, BC – no other condo real estate opportunity matches its value with most homes priced under $398,900. Indulge in downtown living at Era. Make a new account | Forgot your password?